You cannot copy files larger than 2 GB in the default USB mode to your ARCHOS due to the FAT 32 file system constraints. However, changing your USB Mode to 'PC Hard drive' will enable you to transfer files up to 4 GB (except for “.avi” files). For this, go to Menu > Settings > System > USB mode and switch from "Windows Media Device" to "PC Hard Drive". I forgot what the Parental Code is. Where can I get it? Please contact our technical support and give your Product key (MENU > Settings > Software and Plug-ins). You may have not correctly copied your file on the device. If it has been copied in any of the folders of the ARCHOS, it won’t be recognized. You have to copy your downloaded file to the root directory of the device (the root directory or folder is the one where you can see all of the other folders in the device). Yes but you need to connect the ARCHOS in 'Hard Drive' mode. Go to MENU > Settings > System and switch from "Windows Media Device" (default USB connection) to "PC Hard Drive". If you want your music files to be automatically organized by artist, title, genre or year, select "PC Hard Drive (auto-ARCLib)". The default parental code is “0000”. If it is not accepted, that means you have accidentally changed the code. If you do not rembember it, contact our technical support and give your Product Key (MENU > Settings > Software and Plug-ins). The parental code is a parental control which prevents children from accessing content that has been marked as “Adult”. When activated, you need to type a 4 digit personal code to access this content. My ARCHOS displays “Error Code 7.” What should I do? This error occurs when one attempts to install an incompatible firmware. For example, a firmware for the ARCHOS 5 was being installed on an ARCHOS 405. Click on the “MENU” button on the home screen, then choose “Settings” and “Parental Control”. To change this code, select “Change the code”, choose a 4 digit code through the virtual keyboard. Write it down and keep it in a safe place so you do not forget it. Confirm and validate your new code by selecting “Apply”. Then switch from “Parental mode” to “Child” mode.Adult marked content is no longer accessible and the parental control parameters cannot be modified without this code. The battery seems to be fully charged since the battery icon shows ‘full’ but the CHG indicator LED does not blink. If your indicator LED is not blinking, it means that your battery is not fully charged. The battery icon does not indicate the level of charge while it is charging. The flashing lightning just indicates it is charging. You must wait until the green CHG light blinks to be sure the battery is fully charged. It depends on the size and the encoding quality of your files. Battery life lasts up to 16 hours when you play music and up to 5 hours when you play videos. I cannot format my memory card or copy files on it. What should I do? Check to see if your SD card has a small locking switch on it. If your card has a protection lock, make sure that it is switched off. This protection lock allows cards to be protected from writing or deleting. If your computer has a slot for SD cards (or you have an SD card USB adapter), try using your computer to format the card in FAT 32 format. When I insert my SD card, my Archos does not support the format type or freezes. What should I do? - Eject the card and make sure you have the most recent firmware on your device. See http://www.archos.com/support/support_tech/downloads.html to update your Archos device. - Make sure that your memory card is formatted in the Windows FAT* (12, 16, 32) file system. Cards formatted in NTSF or other file systems cannot be read by the Archos. If you can, go to MENU > System and use the “Repair and formatting tools” (more info in the full PDF manual) to reformat the card. Attention: the formatting will erase the contents of your card. Copy them to your computer first if you do not want to lose them. *FAT stands for “File Allocation Table” and is a popular file system used for hard drives and USB keys which is recognized by most computers. Which memory cards are supported by the Archos 405 2GB? The ARCHOS 405 2GB supports SD and SD HC cards (and mini/micro SD cards with an adapter), MMC (and RS MMC with adapter) up to 16 GB. Note: The majority of SD card formats available in the market are compatible with the Archos 405. Although most card manufacturers conform to the SD specification, some may not fully follow such specifications.Unfortunately, due to the large number of cards, a specific compatibility chart is not available. This means that the device recognized that a card has been inserted but it cannot read it. This may be due to a problem with the format on the card. Try to format your card either by using the “Repair and formatting tools” in Menu > Settings > System if you can, or by reformatting it with your computer if you have an SD card reader. If your card has already been formatted, the formatting may have not been successful. Try to format it a second time. Attention: the formatting will erase all the data on your SD card. I have inserted my memory card into the Archos but its contents do not show up in the Music library. Why? Your music files may not be tagged, which means they do not contain any data about artists, titles, or albums. As a result, the files cannot be classified in the Music library categories. To force the Archos to refresh the Music Library, go to MENU > Settings > System and change the USB mode to Hard Drive. Now the button “Update the ARCLibrary” will be enabled and this will recreate your Music library. I have downloaded and synchronized the TV guide to my Archos but when I select the “Recorder” icon, the screen shows “No TV Program Guide information available”. What should I do? First make sure you that your clock and date are correctly set. If you still cannot see your TV guide, and you are sure it has been copied by ArchosLink to your device, try the following: • Make sure that you have Windows Media Player 10 or higher on your computer. • Set your device to Hard Drive mode (Menu > Settings > System > USB mode). • Connect your Archos to your PC and open up the folder “System” of the Archos. • Delete the file “epglist.dat” in the folder “EPG”. • Reconnect to your PC, run ArchosLink, and select the “Update TV Program Guide” and then click on the button “Download”. I can’t download and synchronize the TV Program Guide through ArchosLink. • First, make sure that your Internet connection works and that your Archos is detected by your computer (you will see the name of your Archos device in the lower right corner of the ArchosLink window). • Make sure you are running the latest version of the ArchosLink software. • The message “Synchronization finished” in the bottom right only means that no current podcasts are currently being transferred to your device. • The “Podcast” for your TV Program guide is called “Update TV Program Guide”. This is a special podcast and you will not see a URL associated with it. • If you get an error after the TV program guide downloads (but before it syncs to your device) try restarting your computer and then reconnecting your Archos. Make sure it shows as “connected” in the bottom right of the screen. In ArchosLink, select the “Update TV Program Guide” and then click on the button “download”. I can’t register my DVR Station on my customer account. Why? Where can I register the product? Since the DVR Station is an accessory, it is not registered as a stand alone product. Go to your account page and select your Archos multimedia device. You will find a link on the right labeled “More …”. Click on this link and then click on “Subscribe to the TV Program Guide”. I tried to set my Infrared Emitter but I could not find my tuner brand in the available list. How can I get the DVR Station to control my cable box, satellite receiver, etc.? First, make sure you are running the latest version of the firmware. As there are constantly new video products being added to the market, there may be some devices that are not listed. Try using all of the codes for a particular brand, there are typically more than three or four for any given brand (ex: When setting the code, 2/4 means that your trying code group 2 of 4 available code groups). If your brand is not listed, then try to find out if that brand is actually manufactured by another company whose brand is on the list. The codes for that brand would then be compatible with your device. When I select the “Recorder” icon, it says “Activate the TV Program Guide online” although I have already registered my device on the Archos website. Plug your device into your powered DVR Station and then remove it after 20 seconds. This will ‘reminds’ the 405 that you have a DVR station and can make video recordings. Why can’t I view some of my pictures (JPG and PNG formats) on my Archos 405? The format and/or resolution of the picture files are most likely not supported by the device. Check the resolution, the size and the format of the files. I would like to transfer my DVD’s on my Archos through Windows Media Player but I can’t. Why and what should I do to be able to play them on my device? Some DVD’s are copy-protected and you cannot make copies or transfer them onto your Archos, either through Windows Media Player or by cutting and pasting in Windows Explorer. If the DVD is not copy-protected, you can either convert the DVD to a format readable by the Archos natively (WMV9 or MPEG-4), or you can purchase the Cinema Plug-in which will read MPEG2 file types, the same file type that is inside of the VOB files on the DVD. With this plug-in it is just a matter of copying the .VOB files found on your DVD and pasting them into the Video folder of your Archos. Windows Media Player will not convert a DVD for you. To convert DVDs to a native format mentioned above, you will need a third party software which can rip DVDs. Check out the website www.mpegmobile.com which lists a few of the available third party that can do video conversions and/or DVD ripping. Attention: The converting of a commercial DVD’s to an electronic, transportable format such as MPEG or AVI is known as DVD Ripping. You must ensure that you are authorized to copy before doing such or before copying the VOB files to your Archos. Check your local legislation. Archos does not condone nor support the copying of copyrighted materials, or of the defeating of any copy protection schemes, such as used in some commercial DVD's. 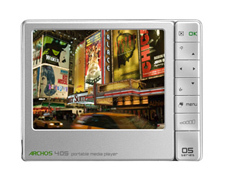 Which formats are supported by the Archos 405? For Video Playback : • MPEG-43 (ASP@L5 AVI, up to DVD resolution), WMV9 (MP@ML, up to DVD resolution) • With optional plug-ins (available on www.archos.com): - Video Podcast plug-in: H.264 up to DVD resolution and AAC - Cinema Plug-in: MPEG-2 MP@ML up to 10 Mbps (up to DVD resolution) and AC3 stereo sound (5.1). For Audio Playback: • Stereo MP3 decoding @ 30-320 Kbits/s CBR & VBR, WMA, Protected WMA, WAV (PCM/ADPCM). • With optional plug-ins (available on www.archos.com): - AAC and AC3 stereo audio files Note: Certain bitrates, resolutions, and/or file variations may not be compatible. For Photo viewing: • JPEG, BMP, PNG Note: Certain resolutions and file sizes may not be compatible. I cannot play files (WMV, WMA and MPEG-4) even though these formats are supposed to be supported by the Archos 405. Why and what should I do? There could be different reasons for this: • The file you are trying to play may be corrupted. Try playing it on another Archos device or a computer to see if it plays. If you have changed the extension of a file, for example by renaming it from basketball.vob to basketball.avi, this does not change its format and it still will not play. • Some WMV or WMA files are purposely copy protected so that you cannot play them. • If video resolution is too high, it may not be able to play. The Archos plays video files up to 720x586 in dimension. • If the video file is type .wmv, it may not necessarily be WMV9. The Archos does not play files encoded in WMV7 and WMV8 which are common WMV types. The Archos does not play wma audio files that are of type ‘Pro’ or ‘Lossless’. In some cases, you may be able to have Windows Media Player 11 convert your files to a readable format by connecting your Archos in ‘Windows Device’ mode and ‘Syncronizing’ the file to your Archos device. There can be different reasons: • Some file types cannot be converted for playback with Windows Media Player. You will need to find a third party software to convert them. • If the license date of a protected file is expired, you could also get an error message. Once a license expires, you cannot do anything with it. • You can also get an error if the file you are trying to sync was on a network that is no longer connected or on an external hard drive that is no longer connected to the computer. Your music files may not be tagged, which means they don’t contain any data about artists, titles or song name. As a result, the files cannot be classified in the Music library categories. To force the Archos to refresh the Music Library, go to Menu > Settings > System > and change the USB mode to Hard Drive. Now the button “Update the ARCLibrary” will be enabled and this will recreate your Music (and Photo) library. I have downloaded the cinema plug in but when I try and drag and drop a VOB file to my video folder on the device it still gives the error message that this type of file is not supported. When copying a .VOB file to your Archos, and your device is in ‘Windows Media Device’ mode (Menu > Settings > System > USB Preference), make sure that you paste the copied file into the folder ‘Video’. Do not try to Synchronize a VOB file with Windows Media Player. You might try changing the USB Preference to ‘Hard Drive’ and copy it over using Windows Explorer. If this does not work, it could be that the DVD has a copy protection system that will not allow VOB files to be copied correctly. Try copying files one at a time, sometimes this can make a difference. Verify as well that the cinema plug-in really did get installed. It will show up in Menu > Settings > Firmware and Plug-ins > Plug-ins. When I switch on my Archos device, the following message is displayed: “Would you like to recover your system?” What does it mean and what should I do? You are on the recovery mode screen. It means that your hard drive has been damaged and must be repaired or formatted. With this system recovery mode, you will have to select between “Repair Disk” and “Format Disk”. Start by selecting “Repair Disk” and follow the instructions displayed on the screen. See the full PDF manual (available on the Archos web site) on how to use the Repair and Format options. If repairing the disk did not work, try formatting the disk by selecting “Format Disk”. Note that the formatting will erase all data. If you still cannot restart your Archos after trying a system recovery, you should contact Archos technical support. When I turn my ARCHOS on, it sometimes freezes and I have to reset it every time. Is there something I should do? I can’t turn my Archos 405 on. What should I do? Try resetting your Archos by pressing the Power button for 15 seconds (which shuts down the device completely) and then turn the device on. If this does not work, you can also press the “master reset” button with a paper clip. For more information, refer to our complete PDF manual online (www.archos.com/support/support_tech/manuals.html). If your device still does not operate after resetting it, you should contact our technical support. For Macintosh and Linux, just copy and paste your music, videos, and photos into the corresponding folder on the ARCHOS once it is connected. • at www.archos.com/manuals to find the latest version of the full user manual. How do I install the optional plug-ins into my device? Firt you need to buy them on our website. Then, follow the install instructions sent to you by email. I have downloaded a plug-in/game file but I cannot install it. The file size is 0 Kb or a message says that it is corrupted or that the update has failed. Your download may have not been successful. - Download your file a second time. - Check that you have entered the Product Key exactly as written as in the settings. You may have typed a wrong Product Key when activating your product. If you still cannot install your file, you should contact our technical support (plugins@archos.com). Note: When connected to a WiFi network, your device detects automatically if a new firmware is available. - Download the firmware from your customer account at www.archos.com/register. This will give you the latest update regarding your product only. Click on "Manage Products" and then on "Support". - Or download the firmware at www.archos.com/firmware. You will find detailed information about the installation process on this page. When you disconnect your device, your ARCHOS will recognize the new update file and will ask you if you want to install it. If you don’t see this message, this means that you have not copied the “.aos” file at the root of the device. Try to locate it from the file browser of your ARCHOS and then execute it by tapping on it. If connecting your cable through a USB hub does not work, plug it to a USB port at the rear of your PC (if it is a desktop). On older computers, the front USB ports may not be sufficient. They are normal files and will not damage the device. Macintosh computers will put "._ files" on the ARCHOS. You can delete those if you prefer.